Have you ever wondered how scientists see the underdrawing of a painting? Although most use sophisticated cameras, you can actually modify your own digital camera to reveal a painting’s underdrawing. That’s because your adapted camera can record infrared light near the visible light spectrum (IRCCD). Some pigments, such as lead white often used for facial complexions, becomes transparent in IRCCD, so that the underdrawing can be seen. 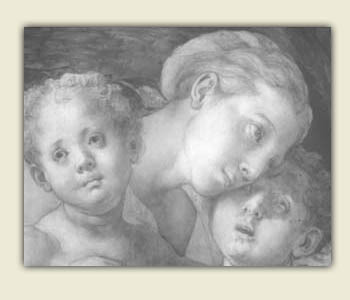 Click on the IRCCD button next to this painting by Pontormo, and follow the outlines of the faces. 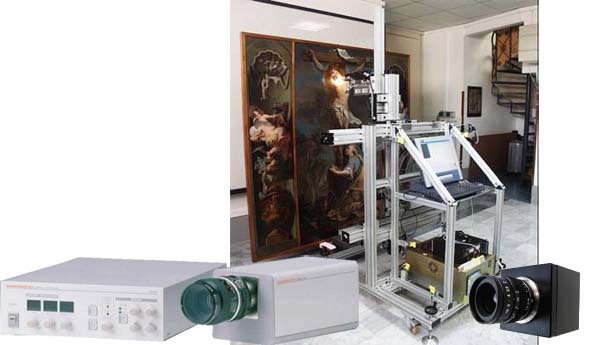 Click on the IRR button, and you’ll see what professional curators discover with specialized equipment for IRR. 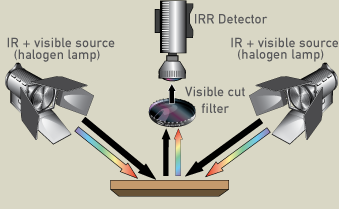 The range of infrared light that is near the visible light spectrum and detectable with a common CCD camera is called IRCCD. 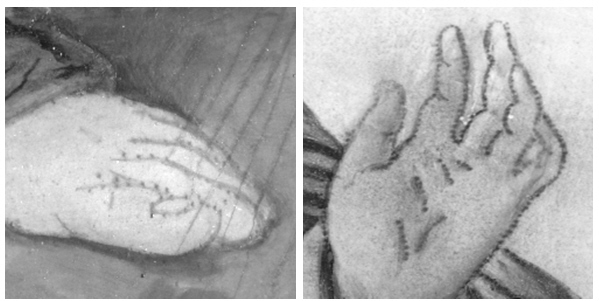 In straightforward cases, IRCCD can reveal the underdrawing in a painting. Some pigments, such as lead white, become transparent with IRCCD. Generally, though, IRR is more effective than IRCCD. IRCCD and IRR are also useful in improving the readability of text in manuscripts that have been erased and overwritten. 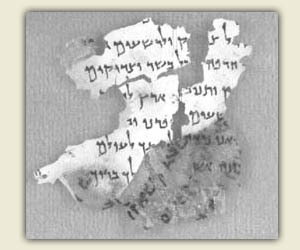 This parchment fragment from the Dead Sea Scrolls was scattered on a Qumran cave floor for 2,000 years. Because the parchment darkened over the centuries, there is no longer contrast between the ink and parchment, rendering the text invisible — but only to the naked eye. Click on the IRCCD tab next to the picture. How has the contrast between the text and the parchment changed? 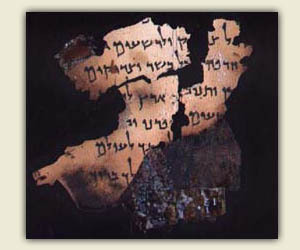 Thanks to IRCCD and other technologies, ancient historical texts can be reconstructed. Near infrared energy is the portion of the electromagnetic spectrum just past the red segment of visible light. Generally, the region between 780 and 1100nm is called IRCCD because a CCD and a slightly modified digital camera can detect this range. False color infrared composites are generated by showing the green parts of the image as blue, the red parts as green, and the near infrared information as red. 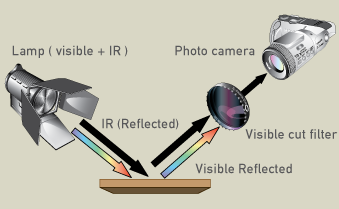 Therefore, two set-ups are needed in order to collect a visible picture (with RGB channels) and an IR picture. Set up to capture an infrared picture with a digital camera. IRFC is created by combining a visible picture with an infrared one (780 - 1100 nm). The green parts of the image are shown as blue, the red parts as green and the near infrared information as red. 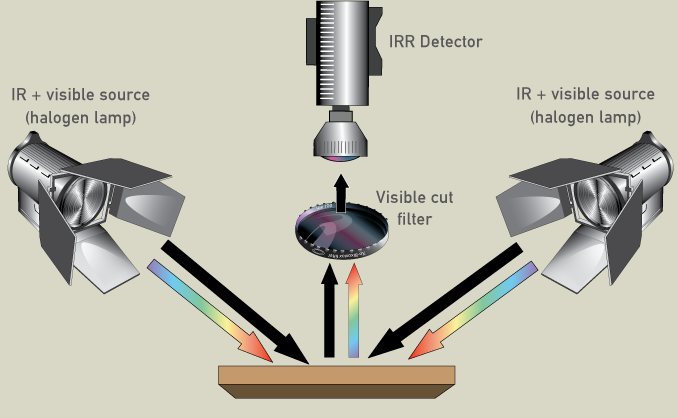 It’s possible to differentiate materials in the resulting false-color image because varying reflectance characteristics in the infrared band are captured and displayed as different colors..
To shoot IRCCD images, you first need to modify your digital camera by removing the IR cut filter (http://www.astrosurf.org/buil/d70/ircut.htm). You then need an IR pass filter (under $100) to cut visible light, and an IR cut filter to take normal pictures. Common IR sources are halogen lamps and incandescent bulbs. 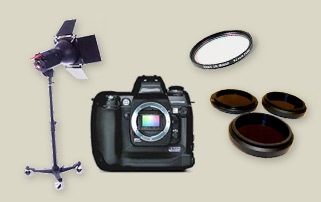 Everything you need to start your own IRCCD photographic studio. From left to right, normal photographic studio lamps, a modified digital camera, a cut UV and IR filter and a cut VIS filter. The term IRR refers to an imaging examination that uses devices which can detect far IR radiation to about 2 microns. 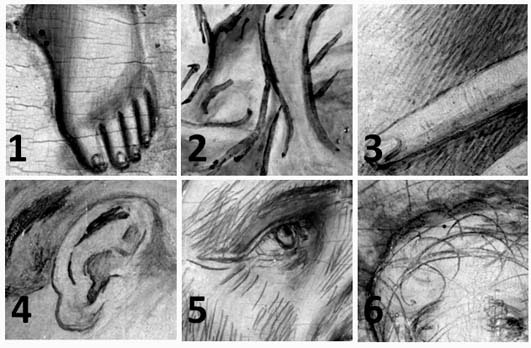 IRR is a powerful method to study the underdrawing technique used by an artist and greatly helps art curators authenticate pieces. Watercolor shading (carbon black), technique suggested by Cennino Cennini (1370-1440). Girolamo Savoldo (1480-1548), brush strokes with characteristic stains at the end. Matteo di Giovanni (1430-1495), carbon black pencil. Fra Bartolomeo (1472-1517), carbon black pencil. 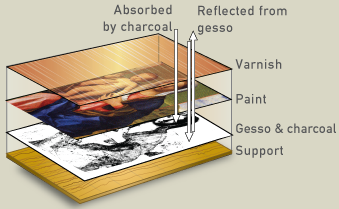 Renaissance artists used an underdrawing technique called ''spolvero.’’ They pressed a dust made of ground, powdered black chalk through the pricked outlines of an original drawing onto a fresh sheet of paper, leaving dotted guiding lines. Artists could then experiment with particularly important or complex parts of their designs. 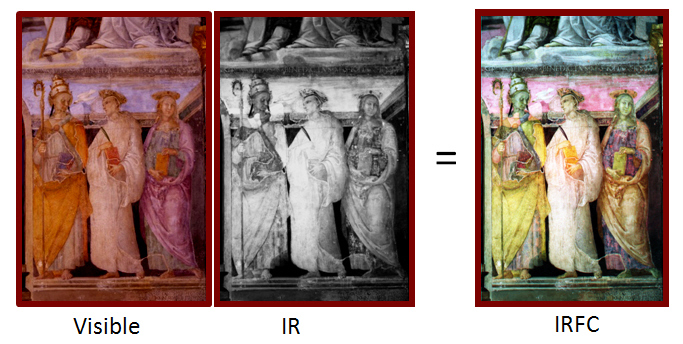 IRR provides evidence of Renaissance artists using the spolvero technique. Left, Raphael (1483-1520), spolvero. Right, Girolamo Savoldo (1480-1548), spolvero. Painters often drew sketches onto their canvasses, which they then ignored or changed. These are called pentimenti, and can be seen through an IRR camera. Finding pentimenti in a painting is often a proof of its authenticity. Indeed, an imitator doesn’t change his composition, whereas an artist often changes many details. 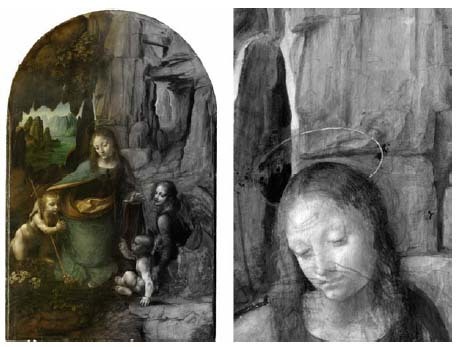 Compare Leonardo’s original painting (right) with the IRR of a detail (left). Do you see some images in the IRR that are not in the final painting? Leonardo, Virgin of the rocks, 1495-1508, National Gallery, London. Using only the light overhead, it would be impossible to look at the Virgin of the Rocks at the National Gallery in London and know that Leonardo da Vinci drew a hand under the Virgin’s face, and that there were many other figures that he never painted. But if you could see the image with an IRR camera, as in the image above, right, you would see the hand just below her mouth. 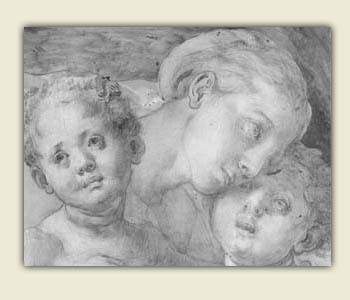 There are other numerous pentimenti or changes to the original design in the underdrawing, such as the alteration of the position of the head and legs of the Christ child and the position of the Virgin’s left hand. 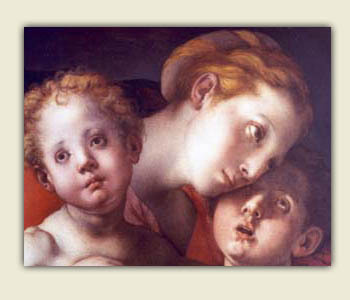 Finding these pentimenti has allowed scholars to conclude that the painting was not intended to be an exact duplicate of the first version of the Virgin of the Rocks, now at the Louvre. Light in the IR spectral range to 2 microns can easily pass through most pigments, making the underdrawing visible. When an IR ray passes through the pictorial film and hits a black carbon line of the underdrawing, it is absorbed. When it hits the ground layer of white gesso (calcium sulfate), the IR light is reflected back. Therefore, the IRR camera "sees" underdrawing as a black area over white gesso. The set up needed to obtain an IRR image with an IRR detector. These instruments look like common video cameras, but actually cost tens of thousands of dollars. Two generations of IRR detectors. On the left is a Vidicon camera. Used in the 60s, it was once the better device for IR reflectography. Today, inGaAs cameras feature focal plain array detectors as CCDs, which are able to sense infrared light to 1.7 microns.